Pepperwood measures precipitation on the preserve and how it flows through the landscape. A network of sensors located across the preserve measures things like rainfall, temperature, humidity, and leaf wetness. 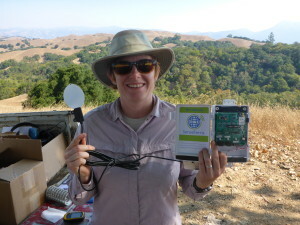 Additionally, Pepperwood is one of only a handful of sites in the entire Bay area equipped with soil moisture probes, which allow us to gain vital insights into the amount of water available to plants in the soil throughout the year. Data from many of our sensors is transmitted wirelessly across the preserve where it can be recorded by a central computer. Our climate-hydrology monitoring work allows researchers to measure the impacts of climate on plant and animal life.